Home » LTG Slider » Block City Wars – Is it worth playing? Do you love the pixelated characters from Minecraft? Do you love the sandbox gameplay and the liberty to do anything, especially living life by breaking all rules in GTA? How about a combination of both? Block City Wars presents you that by providing an extensive gameplay experience that offers a combination of both the gameplay style of GTA 5 and the character graphics of Minecraft. D – Games released an updated version of this game on November 2018 which added lots of new features along with the existing ones. Find out how to play Block City Wars on PC. But is this game really worth giving a shot? Let’s find out. 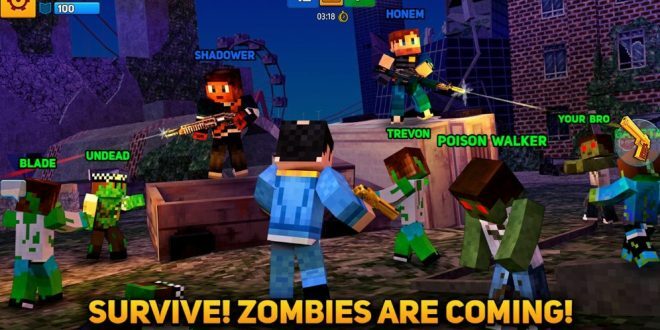 Well, for starters, the game offers 5 modes of multiplayer gameplay which includes Tank Battles, PVP fight, deathmatch among teams, infected zombie mode and street race as well. It has a vast map with a detailed megapolis adorned with high rise buildings and skyscrapers which you are free to explore however you like. There are 50 modes of transport which allow you to roam across the open world, ranging from motorcycles, jetpacks, sports cars, tanks, and army helicopters. Don’t like exploring much? If shooting is what you prefer, the game gives you more than 100 weapon types that include all-time favorite RPG, AK-47, Minigun, sniper rifles along with a Katana. For multiplayer, the game announces a daily list of winners and a complete state report. More than 150000 players access the game with whom you can communicate anytime by an inbuilt chat feature. Graphics and Audio of the game are also unique. Character and buildings are inspired by the pixelated graphics of Minecraft, with dynamic lighting that looks great on any mobile resolution. Apart from default sounds like shooting and other user actions, there is a soothing soundtrack as well that goes well with the game. We are all familiar with Trevor from GTA 5. This game starts with a Minecraft version of him. Your job is to follow the missions or roam around the city if you prefer that. If you prefer to talk less and shoot more, you can battle against rival gangs, army or the police using any weapon of your choice. The story is not that important. The developers focused more on offering a unique gameplay experience. There are multiple gangster missions that you can access in the sandbox mode. PVP mode of this game offers a dynamic experience that is totally different from the story mode. You can customize the appearance of your character, their clothes, and skins with more than 20 options to choose from, pick the weapons of your choice and start battling against other online opponents. PVP is something that the developers have paid special attention to in this game. If you are tired of normal click and build repetitive strategy games and looking for something that offers a story, Block City Wars is worth giving a try with its advanced gameplay, missions that lead to an exciting storyline and the Minecraft inspired graphics. So, better not be late, download the APK from Google Play and start enjoying.